If you’re planning your retirement soon, or have already retired, then you will be aware of the significance of preparing an efficient retirement plan. Minimizing taxes on your retirement income is a crucial part of this plan and that can only be done successfully if you have an actionable plan or follow a guide on minimizing tax on retirement income. Here, we will discuss some critical steps on minimizing tax on your retirement income. Before diving into those steps, you need to figure out some important things; like your current income, service years, spending habits and credit history. Keeping a good credit history and controlling your monthly budget can help in lowering your taxes on retirement income in a big way. It is also important to know about other related questions before moving forward. What Taxes Apply on Retirement Income? The answers are; for tax estimation, you need to calculate tax on your annual salary/income and it also depends on a number of other factors and the retirement plan that you currently have. If your monthly income is over a certain level, then you are likely to pay the highest percentage of taxes. There are different types of retirement incomes, the common types in Canada are Canada Pension Plan (CPP), Old age security (OAS) pensioner, Québec Pension Plan (QPP) benefits, other pensions, retirement allowances, and some other types of incomes as well. You can read about these income types in detail, and learn how you can include them in your tax returns. If you are not sure how to check or calculate your taxes, you can gain help from qualified and reliable income tax planners on retirement income tax estimation. You can also do a simple google search for an income tax calculator for seniors or retirees. You will find a simple calculator that will help you estimate taxes that apply on your income. You can also calculate your retirement potential to get an exact figure. Do remember that this calculation is based on the salary you were getting; but when you retire, it is a completely different story. 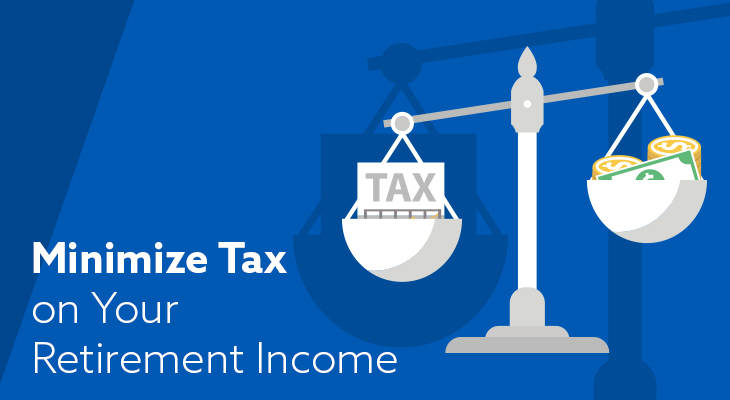 How to Minimize Taxes on Retirement Income? After learning about taxes on retirement, and estimating how much you need to pay on your retirement amount, now you can move on to preparing a plan to minimize tax on your retirement income. For the best strategy, you may need to search for a proper financial planning expert. A good retirement plan will define all of your financial goals after your retirement, and it will be key to manage your finances without having a proper or full salary. Check your income tax bracket threshold, which is as critical as other checklists related to tax on your retirement income. Check the yearly tax bracket you’re in. The tax rate may vary, and in some cases, it may not be implemented on all of your income. Therefore, you can also calculate your tax as a percentage of your income. We have seen a common misconception; people think that they have to pay a higher tax rate if they reach a higher bracket, which is incorrect. When your retirement is approaching, start preparing to take essential steps to manage your finances and taxes after your retirement. In this second step, you have to start reducing your expenses and withdraw less. You need to reduce withdrawal requests from your retirement accounts each year. Controlling your expenses can help in minimizing tax on your retirement income, and the practice also keeps you in the lower tax brackets. Begin by preparing a yearly plan and start with your current spending habits. This plan will help you identify your unnecessary spending and will lower your annual living expenses. Start spending wisely! If you already have different retirement plans, including Registered Retirement Savings Plan (RRSP), Registered Retirement Income Fund (RRIF) or any other, then organize them for withdrawals. You can control your income level from going into the next bracket by focusing on withdrawing money from a good retirement plan, where minimum or no tax is applicable. Withdrawing money from your RRSP account before retirement will follow a process of reporting it on your income tax when you file it. Therefore, it’s better to organize your retirement plan withdrawals according to your needs and avoid unnecessary withdrawals. Social security comes at the very top in income sources. Try to delay taking benefits and don’t utilize this source, unless you are in dire need of funds. Withdrawing benefits, like social security from your retirement savings can push you into the bracket of higher tax. So, delay taking benefits as long as possible and minimize tax on your retirement. We hope that reading the information above will help you reduce tax on your retirement income. If you still want to explore more options based on your current financial situation, then get in touch with us and take advantage of our financial planning services.